In 2004 Canggu Beach hosted the Indonesia Surfing Championship (ISC) chosen for its barrelling waves as well as the beauty of its shores. On the other side of the blue surf one can see tiers of lush green rice paddies where flocks of birds come to fly over or roost. This panoramic scene is rarely found along other beaches and therefore offers a unique experience for its beholders. Sunsets at Canggu can also be quite a surreal experience. Donot forget to enjoy the barbequed corn while watching the sun slowly disappear beyond the horizon. Canggu still remains a rural area, where you wlll be able to experience the simple Balinese village way of life. It takes only some 25 minutes from here to the famous Tanah Lot temple, and some 20 minutes to Seminyak for those who yearn for a more exciting nightlife and loads of shopping. At present Canggu continues to improve its facilities, there are already a number of hotels, villas, restaurants and cafes available to spoil any visitor. 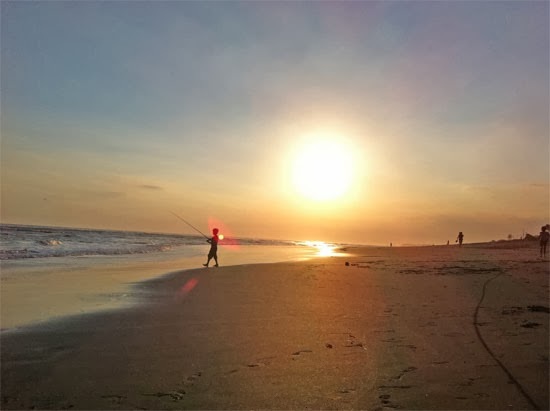 Located some 18 km from the city of Denpasar, Canggu Beach can be reached in 45 minutes by car from Bali’s Ngurah Rai International Airport.When you drive from Kuta Beach it will take only 20 minutes to reach the village of Krobokan. Then turn left until you reach ricefields that touch the ocean. Then you know you have arrived at Canggu. Canggu lies 25 minutes north of Seminyak and is halfway to Tanah Lot. It is advisable to hire your own carm or make sure that your hotel can pick you up from the airport.